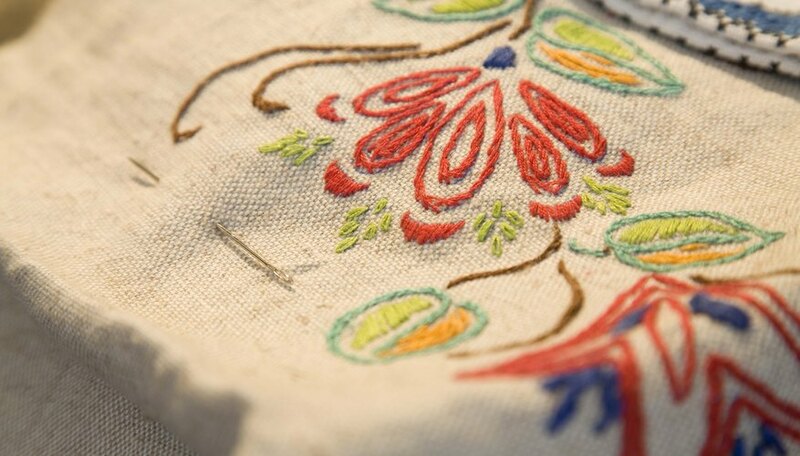 Embroidering is an art that requires patience, experience and the correct tools. There's nothing more frustrating to an embroiderer than finishing a project, only to find that the fabric around the embroidery is puckering. This makes the whole piece look sloppy and rushed. Avoid embroidery puckering by starting with the right fabric and tools to ensure the perfect final product. Select high quality, durable fabrics when working with complex designs that have layering and shading. Choose carefully because the type of fabric will dictate which needle, thread and backing you use. Preshrink the fabric to prepare it for embroidering; this prevents the fabric from shrinking after the embroidery is applied, which will ruin the whole project. Embroider using the correct stabilizer for the fabric. Use a heavier stabilizer for heavier or denser fabrics and use lighter stabilizers for lighter fabrics. Stick the fabric to your backing with adhesive to prevent distortion. Use double-sided embroidery tape or spray adhesive. Embroider the fabric with the smallest needle possible for the fabric and thread you're using; a needle that's too big will cause yarn to move, leaving thread behind that will prevent the fabric from recovering to the correct position. Hoop the fabric with the right tension, making it impossible for the fabric to slip. Wrap duct tape around the hoop and onto the backing to prevent slipping. Loosen the bobbin tension because bobbin tension that's too tight causes the thread to pull the fabric down. Use a tension gauge to assist you in achieving the perfect tension. Embroider with rayon thread instead of polyester thread because polyester thread tends to break more easily than rayon thread when stretched. Embroider with a slower speed to avoid too much tension and mistakes that will cause puckering. Avoid stretching the fabric on the hoop. Leave the fabric in a neutral state to avoid puckering after it's removed from the hoop. Place stabilizers, or backing, under the fabric to hold it in place and create a stable environment for embroidering. Puckering is permanent, so use these tips to help prevent puckering and save you time and money that will be lost if you lose a project to puckering. Barudan.com.au, Why Does the Fabric Pucker During Embroidery? ABC Embroidery Designs.com, 7 Rules for Stabilizing: When, How, Why?